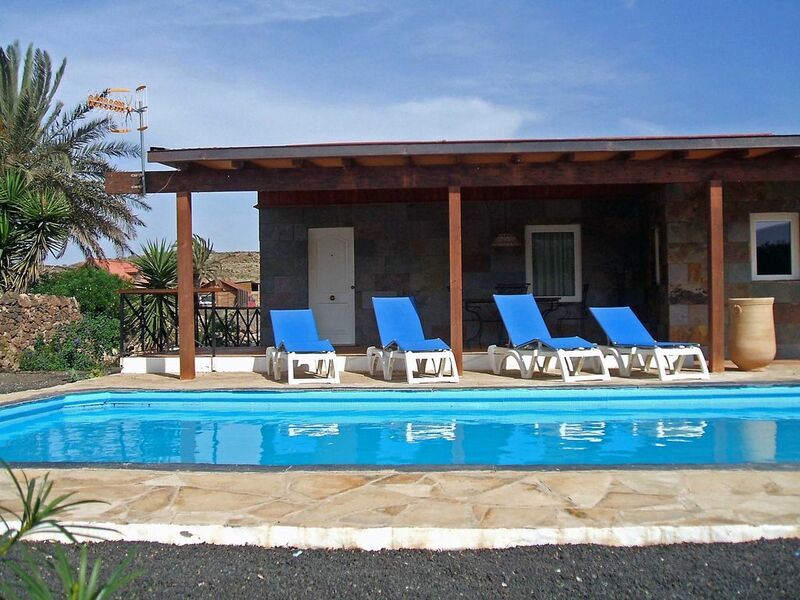 Casa Victor is a vacation house, registration number VV2015/2720, is located in the outskirts of the village of La Oliva, in the North of the beautiful Island of Fuerteventura, The Canary Islands, in a strategic point, locates about 10 minutes driving from “the Lagoons of the Cotillo” and to about 15 minutes driving from “The Great Beaches of Corralejo”. This House is nicely decorated and acclimated to create a comfortable, pleasant and peaceful atmosphere for our guests. That means all the benefits of the village and the tranquility as well, out of the crowded towns and tourist areas. Villa includes a large terrace inc a barbecue, private pool and a garden area with native species of plants as well as satelite TV, and DVD. The parcel is fenced for maximum privacy. Owners live besides it for what you may need!!! We just want to make our Guests feel at home!!! INTERIORS: Studied the different referred parameters from the climate, direction, characteristics of the surroundings, etc. it was decided to solve the construction on the ecological line, with the idea to offer an authentic natural product in all its aspects. The well-known climate of the Canary Islands, in where the average temperature of the year turns around the 22 ºC, reaching high temperatures sometimes however, and the well-known pernicious effect of the climatizadores devices in general, which every time are negatively being recommended by the doctors in general, they inspired to look for new average constructive solutions to us with less artificial. Our supply has solved of natural way east problem by means of the study and later beginning of solutions that control the flows of ventilation and with a correct level of isolation in all the house, getting itself even to study until the election of the type of furniture. MORE ABOUT US: The wood is the great protagonist of our secret. This natural material assures to us that the environmental impact that it took place for his obtaining was minimum and its level of comfort is maximum. In fact, the use of wood pavements in hall and dormitory assures the warmth and comfort to us that we all expect in a vocational period. Central heating as well as air conditioning are not necessary due to the special construction system used. Maid service is an extra at 15GBP/20 Euros per hour. Dining: Seating for 4. The furniture is highly functional, but exotic at the same time, and the colourful one of the lamps, curtains, etc. Entertainment: DVD, CD System, TV sat. Outside: Private Pool/Lagoon, Terrace, Garden, BBQ, Parking, Garden Furniture. The terrace is very large and directed to the South for wind prevention. The off road parking is at the front of the house. Suitability: Children Welcome, Pets Allowed, Smoking Allowed. A cradle and a trona available under requirement. The owner is very amenable and helpful, but the villa has an air of neglect. Driving in we saw that part of the wall by the gate had fallen down and the gate itself had peeling paint, there was quite a lot of garden debris in the corners of the parking area which was not helped by the fact that the garden surrounding the pool/patio area was overgrown and full of weeds. The pool/patio area was fine as were the sitting room and two bedrooms. The bathrooms were dated and not attractive, the shower cubicle in the second bedroom was tiny, only big enough for a small adult or a child and the holder for the shower was not stable, hence when the shower was turned on it would fall off, there was also a leak from the bidet when it was used. The shower cubicle in the main bathroom looked very uninviting, worn and ugly. There were no soap holders in the showers, so soap had to be left on the floor or held permanently whilst showering. The kitchen was very basic, no conventional oven, just a microwave and a hob, there was also no toaster, but we did get one when we asked. The enamel on the tap was peeling off, there were no dinner knives, only steak knives, some of the crockery was chipped and there is no dishwasher but only one tea towel and one small kitchen towel was there for our use, the pipes to the water heater were badly corroded and there was a brown stain on the fridge , which was underneath the heater. The TV has only a couple of English news channels, the remainder are in Spanish or German, our TV had hardly any sound and although we reported it on our second full day we did not get replacement until about 6 days later. Although the pool was nice and clean on our arrival, because it had no cover it soon had dust, insects and floating leaves, no cleaning was done to it for a week, it also leaked but was topped up a few times during our stay. Although there was a filtration system, this was only turned on occasionally and not at all during the first week so the pool began to look quite uninviting Unfortunately there was no cleaning or change of linens during to second week, but of course we did have 2 bedrooms and bathrooms and as there were only 2 of us there was enough for us to use. This was the 4th villa we have had in the Canary Islands and sadly, this was the most expensive but it was the worst. The owner is really nice and I am sorry I cannot give a better review. Very relaxing and peaceful holiday in a beautiful environment . Pretty house with everything you need on holiday in Fuerteventura . Great pool with pleasantly warm water . The house was very clean and the owner has inquired every day according to our wishes. La Oliva is very centrally located for Excursions and nearby are all super retaurantes and bars . A car must be to explore all the beautiful resorts and beaches nearby. Very tired looking villa inside and out in desperate need of some investment to update the poor facilities. Showers are really poor, tiny shower cubicle which leaks and is virtually unusable. Overall bathrooms rather dirty looking, broken tiles, dirty grouting and mastic. Sofas in lounge very uncomfortable. Outside pool was very dirty on first day and garden is overgrown and needs attention. 6 solar lights outside, none of them worked. Would not recommend for the money and sure you could get vastly superior accommodation for similar price. The client who wrote that malicious review has not been fare at all and what he says lacks absolutely of truth. It's wrong and what it´s not acceptable is that after two weeks of having enjoyed a wonderful holiday with his children now he comes with these kind of comments probably in an attempt to make his holiday for free. If the house had been in such a deplorable state as described what he would have to have done it would be to notify it within 24-48 hours of arrival and then it would have been attended but not after the end of his stay. Regarding the pool, there was a huracain over the Canary Island and obviously was full of dust but cleaned inmediately when it passed by... and regarding the water supply: this is a problem every August in Fuerteventura due to the huge influx of tourism at the same time, so that the water suplying company has no more capacity, which unfortunately is completely out of our hands / control. Most of our customers´ reviews are excellent, really good and show the full satisfaction of all of them. We are not worried at all regarding his opinion as far as we know our standard and I can assure you that it is pretty good. He will go to our “black list” straight ahead. heel vriendelijke mensen , heel behulpzaam en je kunt er altijd terecht voor vragen . het huisje is echt gezellig en heel rustig . als je van rust houd moet je zeker naar daar gaan . een groot zwembad en een groot terras , onder het terras kun je gemakkelijk gaan zitten en je hebt er geen last van de wind . binnen in het huisje is het gezellig ingedeeld . een mooie eetkamertje en salon , 2 grote slaapkamer vond ik toch . wat ik ook goed vond dat was die inloop douche . zeker goed voor oudere mensen of invallieden . de keuken is ook ok , er is alles wat je nodig heb . voor te slapen is het heel rustig vind ik . wat mij ook is opgevallen dat de mensen daar gewoon hun deur laten open staan en daar komt niemand binnen , was zo zalig gevoel in fuerteventura . buiten is het zalig s'morgens als je vroeg opstaat de vogels en ook niet vergeten de haan die kraait . zalig om zo uit je bed tekomen . dan zij meneer Juan Ramon Morales hebben wij daar ook een gezellig restaurantje gevonden heel lekker om te gaan eten . dank u daar voor . This is a fine holiday home in good condition with everything necessary to spend some calm days with your family or friends. The pool is quite large and so is the barbecue grill. In the area around are good restaurants and the next supermarket is just 3 minutes by car. It's also a good starting point to explore nothern Fuerteventura as there are some bike and trekking routes (GR-131) nearby reaching from the beaches over desert into the volcanic mountains. Special thanks to the very friendly renters! We were looking for a stay of two weeks somewhere in the north of Fuerte (close by different kind of beaches and close by Corralejo). Also we were looking for quietness, privacy and comfort.... well, I can ensure you that you find al of the above.... AND MORE.... its a beautiful villa with a lovely big pool. The decoration is romantic and complete. But, the most powerful experience of this place is the kindness of Juan and Elena! They give you a real feeling of being welcome..... that's priceless! We recommend this place with full and love hearts and will return! It is a pleasure for us to have clients like you. You will be welcome at any time! Besides the sun pleasure, in the near beaches of Cotillo and Corralejo our Guests can find all kind of sea sports: Fishing, Kite Surf, Wind Surf, Diving and so on. A part from that you can hire a Buggy or All Road, etc. Just having a walk around the countryside can be relaxing in this peaceful landscape full of space and light. You can observe the multiple kinds of autochthon plants and birds or just enjoy a beautiful sunset at Tindaya´s Cliffs. In the village of La Oliva, there are many cultural activities like 'La Cilla', 'Villa de Los Artistas', 'El Museo de Mane' or 'La Casa de los coroneles'. In Villaverde, 5 minutes away, you can find the 'Centro de Interpretación' if you are interested in knowing how the Canary Islands were formed. Otherwise you can enjoy the Canaries food in the nearest restaurants of Villaverde, 'El Horno', 'Casa Marcos' o 'El Mahou', or a fresh fish in El Cotillo as well as international dishes in any of the multiple restaurants in Corralejo.